Summer is the best time for new shoes styles and limitless opportunities to let your toes out. When the temperature goes up, people want to enjoy footwear with less features like flip-fops, strappy sandals, crocs, gladiators, and wedges. The warm weather is the perfect excuse to show off your freshly painted nails while letting your feet breathe a little better. If you’ve had the shoes for more than two summers, throw them away. The materials of footwear generally begin to deteriorate by the two-year mark, regardless of how often you use them. Your sandal or heels may appear to be in good shape and even fit comfortably, but there is a good chance that they have begun to break down, bottom out, dry and flake. This type of material degradation can result in less or no shock absorption, in addition to less functional support. The older they are, the worse they are for you. You want to be wearing something that supports the arch to ultimately reinforce ankle stability. Being secure longways and side-to-side can help the feet land uniform against flat and uneven surfaces. Many flip-flops and “slips” have a base that is completely flat. Having a completely flat shoe bottom can promote foot fatigue and aches around the foot and ankle. Lack of support to the center of the foot is one of the leading causes of plantar fasciitis, a condition that tens of thousands of American suffer from. Having a loose heel can be the cause of several problems. Without a secure heel, the toes tend to grip during each stride. As the toes attempt to stabilize the footwear, it strains the tendons of the foot and can cause pain in the arch and shins. Prolonged habits of this can damage toenails and deform the toes into what are known as hammertoes. Leaving the heel out to move around can promote bruising, callousing, and cracking of the skin on and beside the major part of the heel. The shank is basically the bottom of the shoe. If it is easily bendable in all directions this would be considered an unstable surface to walk upon. Overly flexible shanks can cause the foot to work in ways that it’s not supposed to thus resulting in fatigue and pain. Stiffer shoe bottoms are generally better especially if they include good arch and heel support. 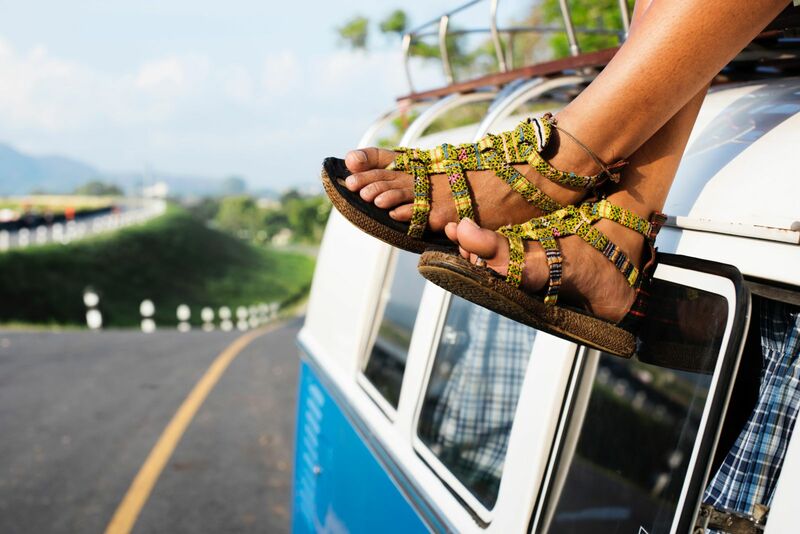 If you choose to wear open footwear make sure to wash your feet regularly to prevent skin infections, blisters, warts, and fungal development including athlete's foot. Would you really want to get into your bed after walking around the city for several hours with your feet exposed? Be cautious of trauma. Having your toes and feet open makes your much more likely to experience accidents such as cuts, stubbing your toes, splinters, falling objects, and cracked toenails. Having lose fitting shoes increases the risk of stumbling and slipping on surfaces. You have much less control and support when walking on uneven pavement, hot surfaces, and wet surfaces in flip-flops, wedges, and flats, so be very careful. Don’t wear the same style all the time. It is important to change your shoes at least once a day to reduce stress and strain on your back, calves, shins, and knees. Using different footwear throughout the day helps challenge your body to engage different muscles and functioning parts, ultimately making you better adapted to the surfaces you stand on.